The Royal Canadian Legion, BC/Yukon Command has lobbied the NDP Government to expand the eligibility criteria to provide British Columbia Military Veteran Licence Plates and rescind use of the Legion’s poppy design on the BC Veterans License Plates, UNLESS RCMP members, who have NO military service, are included in the Veteran eligibility criteria. Serving in the Canadian Armed Forces or the RCMP are two distinctly different services; “never the twain shall become one”. 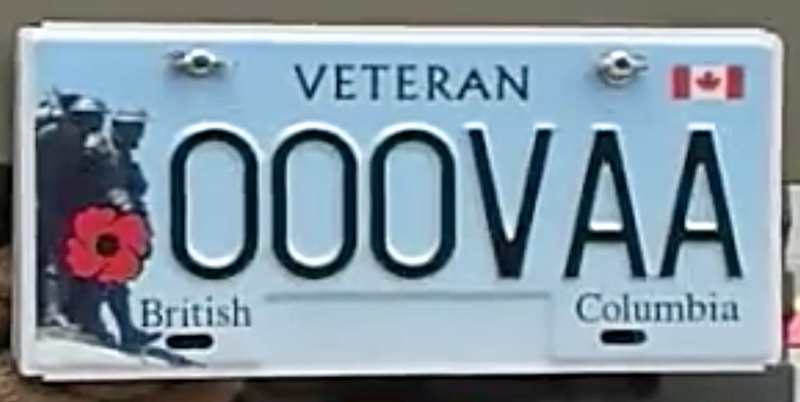 The BC Veterans Commemorative Association (BCVCA), the BC Liberal Caucus and Military Veterans are opposed to any changes to the eligibility criteria to receive a BC Military Veteran Licence Plate. A unique First Responders Specialty Licence Plate honouring Police, Firefighters, Paramedics, Canadian Coast Guard and Mountain Rescue members has been recommended. The RCMP is a Canadian National Police Force responsible for federal law enforcement in all Canadian provinces and territories. The RCMP is not tasked to serve internationally. A RNWM Police force contingent participated in the North West Rebellion, 1885, and RCMP members voluntarily enlisted in the Canada’s Armed Forces, with service in the South African War, WWI & WWII. BCVCA ensured the BC RCMP Deputy Commissioner was briefed about this Legion controversy to avoid misrepresentation of BCVCA’s intent. Veterans Affairs Canada (VAC) administers RCMP health care benefits and pensions, but does not recognize RCMP members as Military Veterans. VAC & DND considers any former member of the Canadian Armed Forces who releases with an honourable discharge and who successfully underwent basic training to be a Veteran. Please note, RCMP members are NOT included. BC Citizens, this is a Call to Action, “Preserve Our Military Veteran Legacy” by completing BC Attorney General David Eby’s carefully crafted survey. The survey’s completion date is September 4, 2018. In the survey’s last question, where it says “Other”, write in “None of the Above”. This is your only way to say “NO”. Also, please write Mr. Eby a letter advising of your disapproval. Military Veterans Deserve Our Respect, Now and Forever.